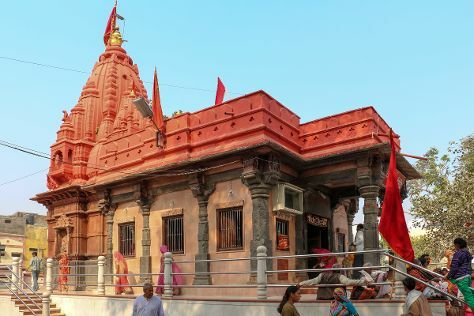 The capital of one of the region's ancient kingdoms, Ujjain lost some of its political and cultural importance during the years of the Raj. Kick off your visit on the 22nd (Mon): explore and take pictures at Sandipani Ashram, contemplate in the serene atmosphere at Mangalnath Temple, take in the spiritual surroundings of Kal Bhairav Temple, then take in the spiritual surroundings of Harsiddhi Temple, and finally take in the spiritual surroundings of Chintaman Ganesh Temple. To plan Ujjain vacation without wasting time, ask Inspirock to design an itinerary. The Route module can give you travel options from your home to Ujjain. In April, daytime highs in Ujjain are 44°C, while nighttime lows are 24°C. Wrap up your sightseeing on the 22nd (Mon) early enough to drive to Indore. The commercial capital of Madhya Pradesh, Indore blends its historic past with future-oriented modernization. Start off your visit on the 23rd (Tue): look for all kinds of wild species at Kalsubai Harishchandragad Wildlife Sanctuary, then stop by Chappan Bazar, then take in the spiritual surroundings of Khajrana Ganesh Mandir, and finally contemplate in the serene atmosphere at Shri Siddh Vijay Ganesh Mandir. On the 24th (Wed), you'll have a packed day of sightseeing: contemplate the long history of Rajwada Indore, browse the eclectic array of goods at Sarafa Bazaar, take in the spiritual surroundings of Kanch Mandir, then take in the spiritual surroundings of Annapurna Temple, and finally stroll around Regional Park. To find where to stay, more things to do, reviews, and tourist information, read our Indore route planning app . Traveling by car from Ujjain to Indore takes an hour. Alternatively, you can take a train; or take a bus. In April, plan for daily highs up to 44°C, and evening lows to 24°C. Finish your sightseeing early on the 24th (Wed) so you can drive to Bhopal. A pair of vast lakes separate the old and the new in Bhopal, the state capital. 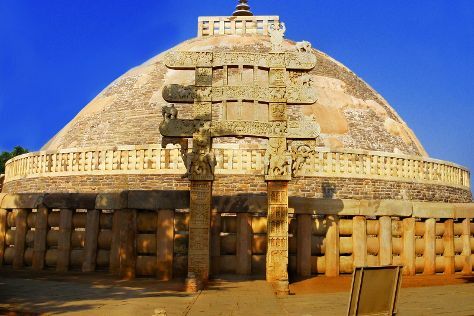 On the 25th (Thu), explore the fascinating underground world of Rock Shelters of Bhimbetka, then contemplate in the serene atmosphere at Gupta Temple, and then delve into the distant past at Buddhist Monuments at Sanchi. On the 26th (Fri), you'll have a packed day of sightseeing: explore the striking landscape of Van Vihar National Park. To find ratings, other places to visit, and tourist information, go to the Bhopal trip app . Traveling by car from Indore to Bhopal takes 3 hours. Alternatively, you can take a bus; or take a train. In April, plan for daily highs up to 45°C, and evening lows to 26°C. On the 27th (Sat), wrap the sightseeing up by early afternoon so you can drive back home. 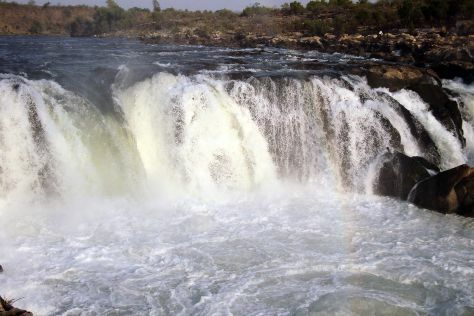 Many of the cultural and natural attractions of Jabalpur stem from the city's surrounding abundance of marble. Kick off your visit on the 28th (Sun): contemplate in the serene atmosphere at Chaushat Yogini, then don't miss a visit to Marble Rocks at Bhedaghat, then admire the sheer force of Dhuandhar Falls, and finally take in the spiritual surroundings of Paat Baba Temple. Get ready for a full day of sightseeing on the next day: tour the pleasant surroundings at Balancing Rocks, take in the spiritual surroundings of Pisanhari Ki Madiya, and then admire the engineering at Bargi Dam. Inspirock's itinerary builder makes planning a Jabalpur trip simple and quick. Traveling by car from Bhopal to Jabalpur takes 7 hours. 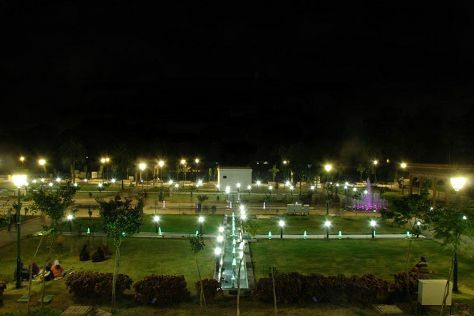 In April in Jabalpur, expect temperatures between 45°C during the day and 26°C at night. Wrap up your sightseeing by early afternoon on the 30th (Tue) to allow enough time to travel back home.